A new hybrid coupled model (HCM) is presented in this study, which consists of an intermediate tropical Pacific Ocean model and a global atmospheric general circulation model. The ocean component is the intermediate ocean model (IOM) of the intermediate coupled model (ICM) used at the Institute of Oceanology, Chinese Academy of Sciences (IOCAS). The atmospheric component is ECHAM5, the fifth version of the Max Planck Institute for Meteorology atmospheric general circulation model. The HCM integrates its atmospheric and oceanic components by using an anomaly coupling strategy. A 100-year simulation has been made with the HCM and its simulation skills are evaluated, including the interannual variability of SST over the tropical Pacific and the ENSO-related responses of the global atmosphere. The model shows irregular occurrence of ENSO events with a spectral range between two and five years. The amplitude and lifetime of ENSO events and the annual phase-locking of SST anomalies are also reproduced realistically. Despite the slightly stronger variance of SST anomalies over the central Pacific than observed in the HCM, the patterns of atmospheric anomalies related to ENSO, such as sea level pressure, temperature and precipitation, are in broad agreement with observations. Therefore, this model can not only simulate the ENSO variability, but also reproduce the global atmospheric variability associated with ENSO, thereby providing a useful modeling tool for ENSO studies. Further model applications of ENSO modulations by ocean-atmosphere processes, and of ENSO-related climate prediction, are also discussed. • A new HCM is successfully constructed by combining ECHAM5 and IOCAS IOM. • The HCM can simulate ENSO events with realistic irregularity, amplitude and frequency, as in observations. 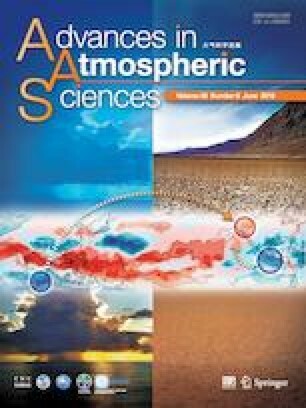 • The simulated global atmospheric responses to ENSO in the surface climate and circulation are comparable to observations. ENSO是气候系统中最强的年际信号且具有广泛的气候影响, 所以, 对ENSO的模拟和预测具有重要的意义. 海气耦合模式是实现模拟和预测ENSO的主要工具, 其中, 简单海气耦合模式的动力过程简单, 一般为仅限于热带太平洋海域的距平模式, 计算量小, 但无法直接模拟和预测ENSO引起的全球范围的气候异常; 而全球海气耦合模式的物理过程更为复杂和完善, 可以直接模拟和预测热带外的气候异常, 但是一直受到“气候漂移”问题的困扰. 所以, 希望发展一个耦合模式, 既没有气候漂移, 又能够预测全球气候变化. 因此, 本文将热带太平洋区域海洋模式和全球大气环流模式耦合, 构建了一个新的混合型海气耦合模式(HCM), 其中, 海洋部分为中国科学院海洋研究所海气耦合模式(IOCAS ICM)的简单海洋模式, 大气部分为德国马普气象研究所的第五代大气环流模式(ECHAM5). 海洋和大气之间通过距平的动量通量和热量通量耦合. 利用HCM 100年模拟积分的结果, 对模式中ENSO及其全球大气响应的模拟进行了分析. 结果表明, 与IOCAS ICM相比, HCM中的ENSO事件具有显著的不规则性, 主要周期为2-5年振荡, 模拟的ENSO强度, 循环和季节锁相都与观测更为一致. 另外, HCM的大气分量表现出显著的年际变化, 冬, 夏季海平面气压, 温度, 降水和异常环流的分布与观测基本相符. 所以, 该模式不仅能够模拟ENSO及全球大气响应, 而且能够避免气候漂移, 计算量也远远小于复杂的全球海气耦合模式, 进而为ENSO模拟和预测研究提供了新的工具. This research was supported by the National Natural Science Foundation of China (NFSC; Grant No. 41706016), the National Programme on Global Change and Air-Sea Interaction (Grant No. GASI-IPOVAI-06), the NFSC [Grant Nos. 41690122(41690120), 41606019 and 41421005], the Strategic Priority Research Program of the Chinese Academy of Sciences (Grant No. XDA19060102), and the NSFC–Shandong Joint Fund for Marine Science Research Centers (Grant No. U1406402).